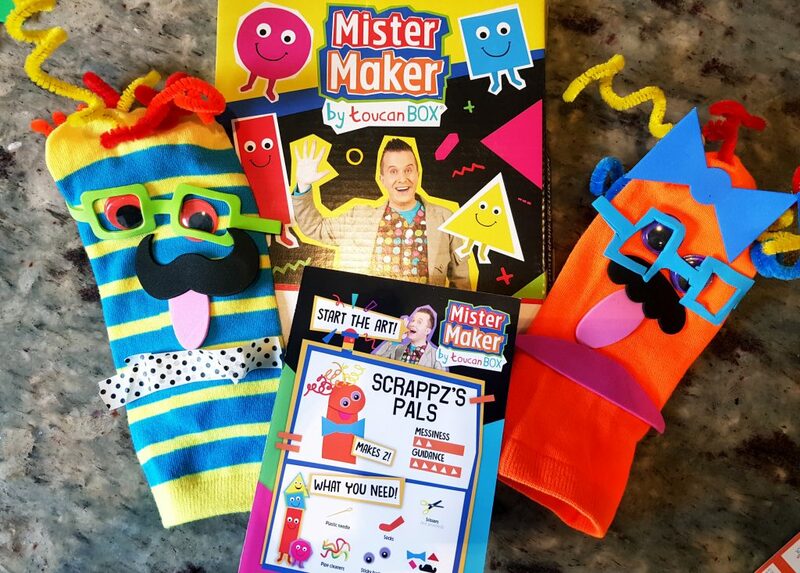 Mister Maker is a collaboration between Toucan Box, which makes craft subscription boxes for kids, and Mister Maker, a kids TV show on CBeebies. 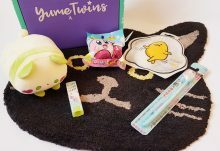 The box is small and thin enough to fit through the door, and is addressed to your child, which is a nice touch. The box unfolds. There’s a description of the craft on the left, instructions on top, and all the bits and pieces you need for the craft. 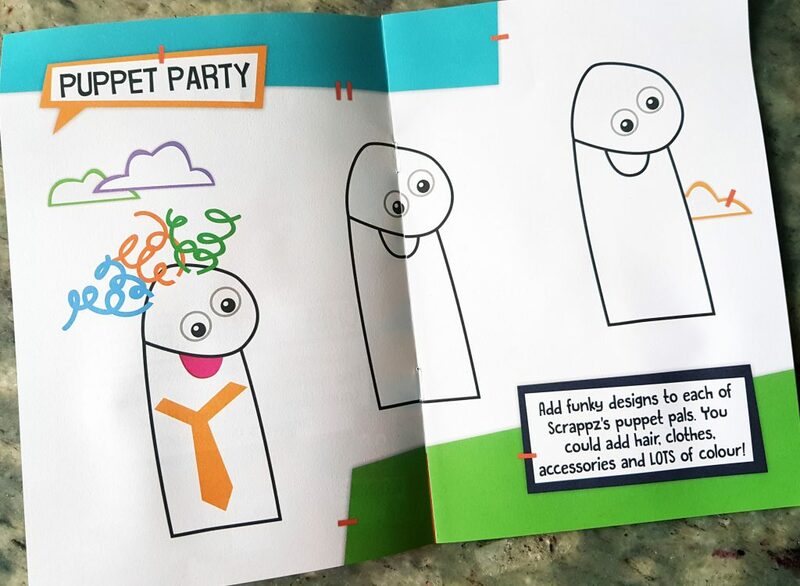 As well as the craft items, there’s an activity book with a few fun things to do. 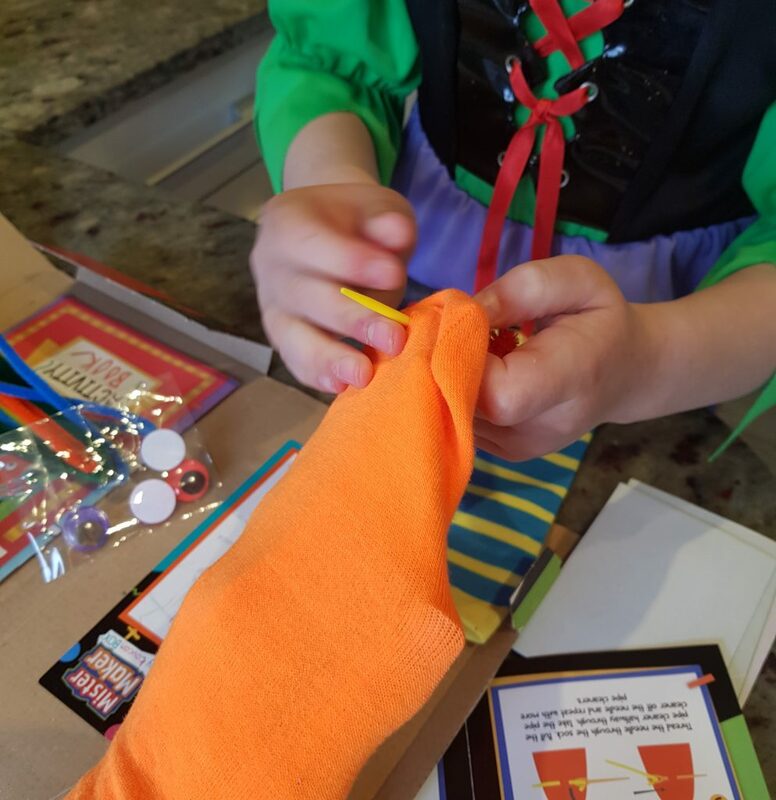 The craft in this particular box is making two sock puppets. You get two socks, pipe cleaners, eyes, and some self adhesive foam shapes. The instructions are very simple and easy to follow. 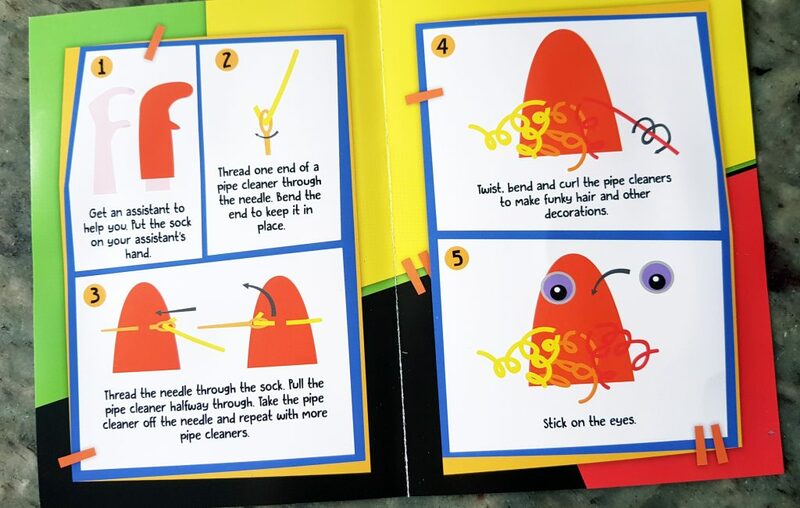 There was a plastic needle through which the pipe cleaners were threaded to push them through the sock. It was actually surprisingly easy! The foam shapes were to make and decorate the faces. The glasses were very useful because the eyes didn’t stick very well on their own! 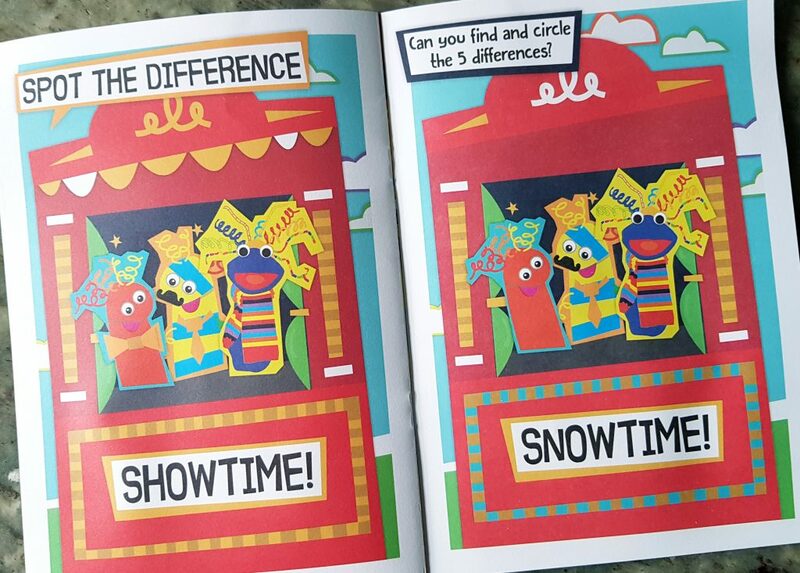 And here are the finished puppets! This is a lovely simple craft that looks terrific. I can’t find anywhere that gives the age group, but I would say up to age 7 or 8. 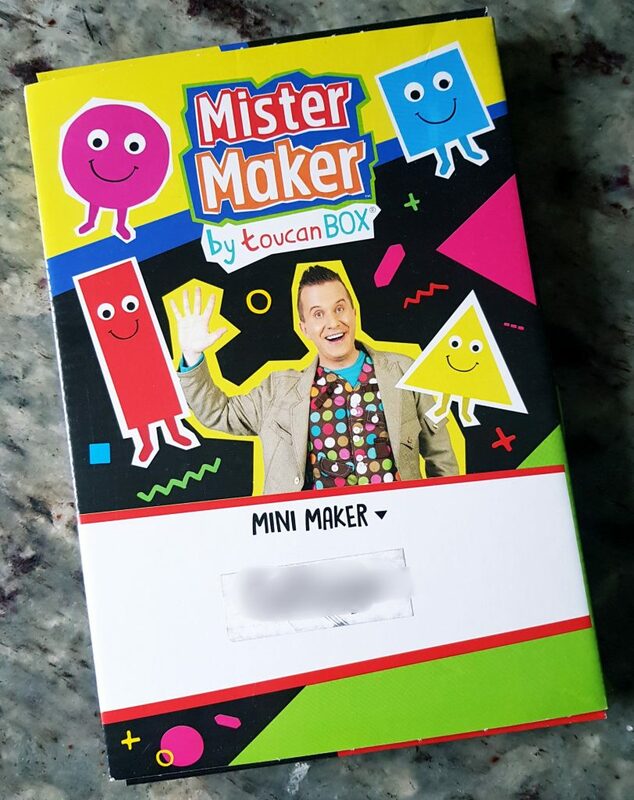 I should say we don’t watch terrestrial TV at all (never seen CBeebies, which apparently broadcasts this show) so neither of us had a clue who Mister Maker was. However this did not affect our enjoyment! 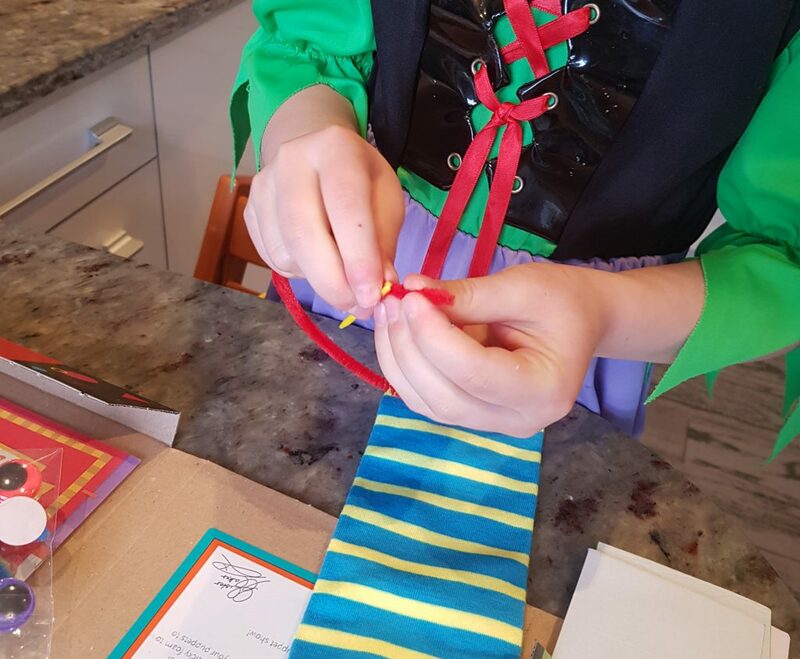 Little C, my lovely helper, is seven and a half, so at the upper portion of the age range. This was a craft that she whizzed through very fast and entirely on her own. (I think it was about 15 minutes from opening the box to sticking the last bit of foam on.) The only thing I did was to put my hand in the sock so it was easier to thread the pipe cleaners through. 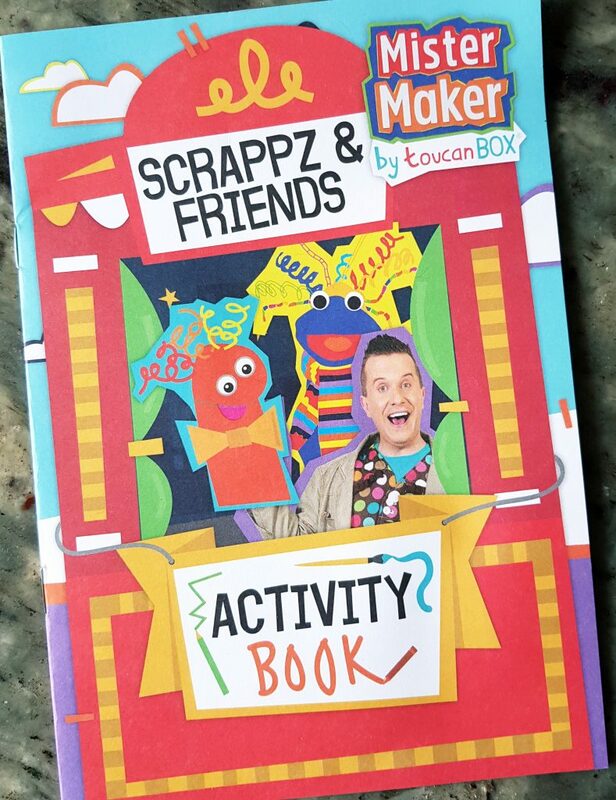 The activity booklet, while cute, was on the simple side, but for younger children it would be perfect. Little C enjoyed making the puppets enormously! 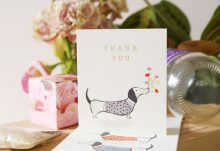 The colours are bright and fun, it’s clear and simple, and the results are fantastic. 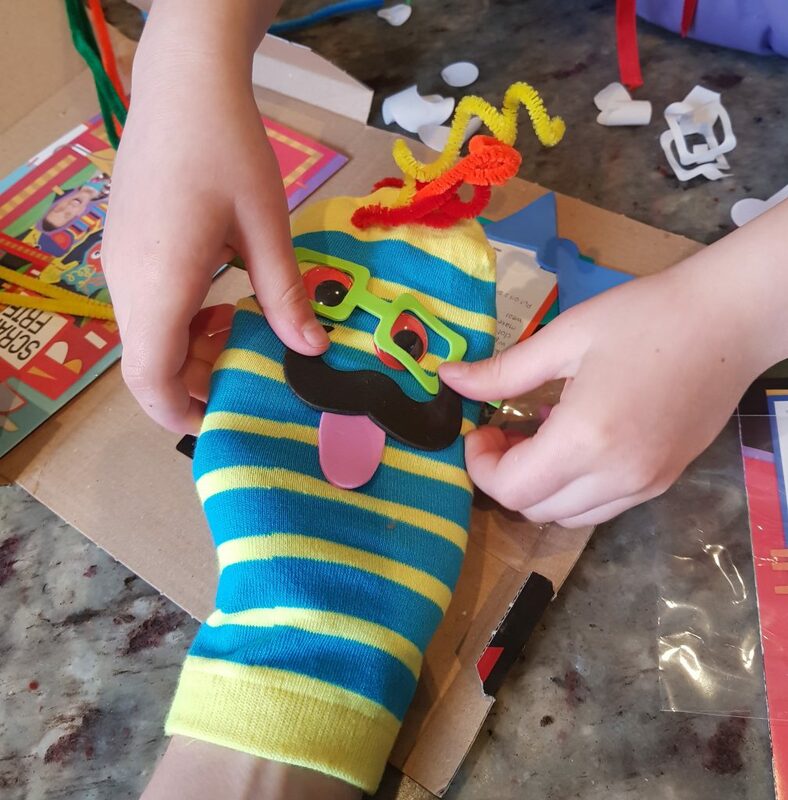 I think my only gripe is that the socks were rather small, so it was difficult to do the traditional sock puppet by making a mouth with your hand. 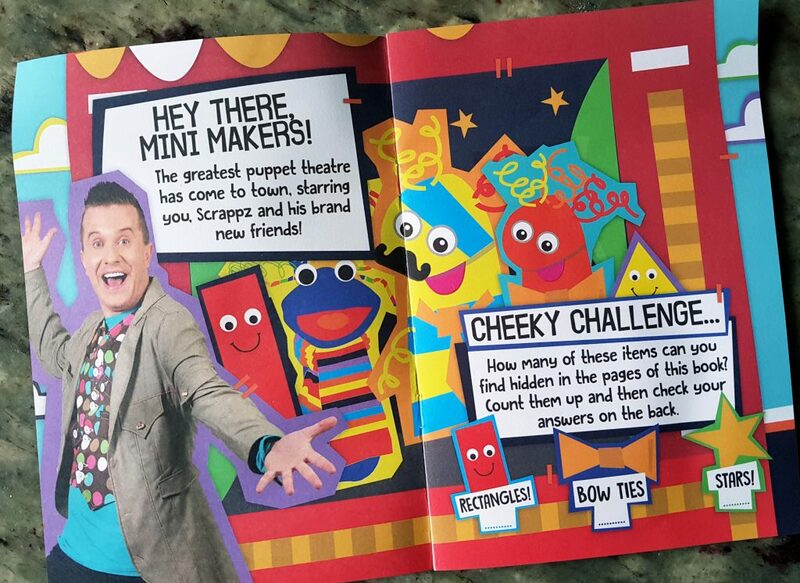 However we still ended up with two cheerful-looking puppets! 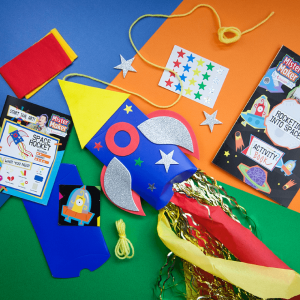 This is a good creative craft, and has ongoing use with imaginative play. 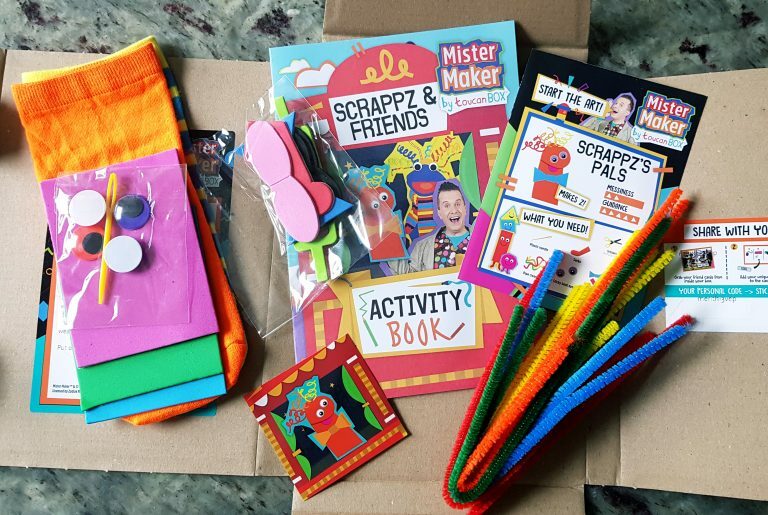 A fun and simple craft kit, best for younger children. Lovely and bright, and the result is very satisfying. 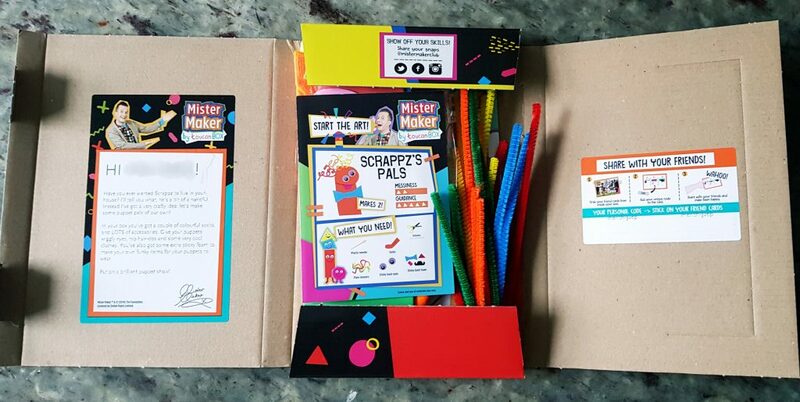 How would you rate Mister Maker Craft Box ?